"The shortest route between two points is a straight line." That was the Bears mantra for the season as running back Isaiah Crowell lead the team to a 13-3 record and a NFC North division title. To say Crowell had a great season would be an understatement. The Crow lead the league with 2,351 yards and 25 touchdowns on 411 carries (5.72 YPC). To put that in perspective, the rookie rushing record was previously held by Jonas Gray with 2037 yards with 20 touchdowns on 443 carries (4.59 YPC). That a difference of over 300 yards, 5 touchdowns, and most importantly an entire yard per carry higher. That's a nice record, but take it one level higher. 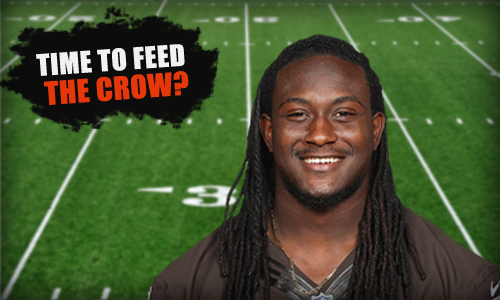 Crowell has set the season records for most rushing yards and rushing TDs. The previous record holder was Jamaal Charles at 2150 yards on 476 carries (4.51 YPC). Perhaps the most important stat to avoid for Coach Lynch was avoiding the all-time carries list. We are pleased to report that despite holding the All-Time rushing record, Crowell does not appear on the top 5 list of carries in a season. It has been a genuine pleasure to watch this guy carry an inept QB to the #2 seed in the playoffs. He constantly faces 9-10 guys in the box and still manages to deliver. PFL, meet your offensive rookie of the year and MVP. The Chicago Bears, one of the charter teams of the NFL, steeped in proud tradition, underperformed to produce the worst record in their storied existence. There were a few close games and some flashes of potential, but at the end of the day, 1-15 is 1-15, and that is unacceptable for a professional football team. There are many reasons for the horrendous record: lackluster playcalling, improper allocation of talent, a slow and aging receiving corps & defensive backfield, questionable offseason moves, an offensive line in transition, sticking with a defensive playbook that is indecisive in its scheme, and impatience in the run game. Fortunately, the season is behind us, we can learn from our mistakes, capitalize on the few positives, adjust, and strive to perform to the quality that is expected of our team. On the positive side, we have the first overall pick in the draft, as well as additional mid-level draft picks, and respectable cap space. Last year's first round draft pick, Tyrod Taylor, performed better than the pundits expected. The linbacking corps are solid and have depth. Both the offensive and defensive front lines have shown that they can play at a high level. We'll be changing our defensive scheme to a more stable system that plays to our strengths. We'll use our resources in the offseason to get younger and faster. We'll draft according to talent, as opposed to need. This season sucked for the Bears, but the future is open and we plan to be a part of it. Ouch. Just frigin' ouch. Even the close games are disappointing (and this week's certainly wasn't). The offensive line (while good on paper) is porous as hell, with the constant push up the middle we can't even get a play established to even consider a run game; Clausen and Fajardo are panicked for their lives and just trying to get rid of the ball before their respective heads get knocked off; Clausen can make plays on occasion, but our veteran "elite" # 1 & 2 receivers seem to be afraid of the ball and are running crappy routes; HB Gray can run if he gets the time for a play to develop (he's one of our best receivers, that's the only way he can get positive yards); Our d-line will stuff play after play then give up double digit td runs; aside from Darryl Lloyd, the rest of the defense thinks it's flag football and a light slap will bring the ball carrier down; our defensive backfield will allow catches to anyone even with triple coverage...F#%$!!!!!!!!!!!!!! Last season was the first time in 6 seasons that the Bears had a losing season. Granted, there was a mid-season change in the front office, but the collapse of the season shouldn't have happened, especially with the talent that was present. So what does the new GM do? He blows up the roster and tries to regroup with a team that matches his game philosophy. Whether or not that was a wise decision remains to be seen, but here's a rundown of the offseason under the new regime. QB-Kind of a head scratcher here. McGloin was the face of the offense and was playing well in my system. Historically, however, he threw a lot of picks and we were offered a first rounder next season in addition to a solid QB that has played in our system before in Jimmy Clausen. For insurance, we got a great player to develop in Fajardo. Not the ideal arm strength, but his accuracy and intelligence makes him perfect for our team. Renfeld gives us the extra veteran comfort level. FB- Arian Foster is the ideal FB for a coach that likes to change up his run schemes. Connor is a nice backup, which is why I used one of my resigns on him, They're a little long in the tooth, but they can get the job done. WR-Speaking of players that are long in the tooth but are still elite, I love our receivers. Newly acquired FA Greg Childs and rookie Ted Haynes aren't the fastest guys out there, but their size and hands make them great slot receivers and lets Knox and Sanders stay fresh for their return duties. TE-The Deuce pretty much built the TE roster as an expansion of the WR corps, which is great (we resigned Megatron), but with our run packages we need someone who can block as well, which is why we brought in a more rounded starting TE with Trent Wicks. He still has great hands, but can block as well. MLB-We have Darrell Lloyd. He fits the mold of the Bear linebacker.We brought in Beauhamais &Reddick because they have more physical talent that what we previously had and can both develop in the jack position. CB-Lotta controversy in trading away Gilmore. He is an undeniable talent who hasn't yet reached his prime. I try to look to the future though, so the combination of a late first round pick and elite CB Kenny Carson in return was hard to pass up. I have faith that Carson & Thomas will be a threat to any opposing passers. Not sure yet if Barnes or Carufel will be at nickle, but it's win-win either way. FS/SS-No real need for change at FS. I went into the draft with every confidence in SS Juan Drake taking the reigns at SS, but still needed some depth at the position. Landon Collins was actually higher on our big board than Beasly was, but I was wary of taking a safety that early in the draft. Fortunately, the Lions helped us out with the decision and we were still able to get Beasly who we thought would have a bigger impact anyway. We were still able to get a serious upgrade with Jordan Richards. It's been a bit since a PFL game, but now I remember why I love this league. We lost, but it was a great game. There was no stopping Johnny Football, everything Manziel did was perfect. We gave it our all but the closest we came was 1 TD down. Props to BCreek, he coached a hell of a game. Looking forward to next week! Peppy: Hey. Unfortunately, my efforts in Carolina didn't pan out. We built an incredibly talented team, but I was not able to properly guide them to success. I'd like to thank Jerry and all of the fans and staff from the Panthers for giving me the opportunity to represent your proud team.The next coach who has the privilege to lead the panthers has a wonderful team and fan base, I wish him all the luck and am frankly a little scared of playing against the fine players who are on the team. On a more positive note, I'd like to thank the McKasky family for giving me the opportunity to lead the Bears. I grew up a Bears fan and I have followed their progress. I am inheriting a great team and I'd like to give props to Bill for building a good structure. We'll be following team president Ted Phillip's suggestion to vary our playbook structure and work to our players' strengths instead of forcing our team to adapt to my game philosophy, which was more then likely the cause of my issues in Carolina. While I'm a little intrepid about the first-class teams that we will face twice a year in the NFC North, I hope to give the Chicago faithful fans a team that they can be proud of.